Top seed outlook: According to the FiveThirtyEight model, top seed Duke has the best chance of advancing to the Final Four in the entire field (53 percent probability) as well as the best odds of winning the national title (19 percent). What this team lacks, however, is touch along the perimeter. Duke shoots a ghastly 30.2 percent from beyond the arc, the worst mark among tournament-qualifying teams. In an offensive era increasingly dominated by space and perimeter scoring, the Blue Devils could buck the trend punishing the rim. On the other side of the region is the winner of the Big Ten conference tournament, Michigan State. As their reward, the No. 2 Spartans have the honor of a potential matchup against the top overall seed in the Elite Eight. Head coach Tom Izzo was none too pleased. The Spartans have been pummeled by injuries but remain one of the most balanced teams in the country, ranking inside the top eight in Pomeroy’s adjusted offense and defense metrics. Sneaky Final Four pick: No. 4 Virginia Tech. Led by the star pairing of Kerry Blackshear Jr. and Nickeil Alexander-Walker, the Hokies are a balanced squad that ranks among Pomeroy’s Top 25 teams on both offense and defense. Although they’ve lost eight times, only two of those were by double-digits. Virginia Tech also has a not-altogether-unfriendly draw, with extremely winnable opening games against Saint Louis (87 percent) and the Mississippi State-Liberty winner (63 percent) before most likely running into Duke’s juggernaut. We give the Hokies a respectable 25 percent chance against the Blue Devils — and a 54 percent chance against whoever emerges from the bottom of the region if they do manage to knock off Duke. Don’t bet on: No. 3 LSU. With coach Will Wade embroiled in a pay-for-play scandal and his team probably overvalued as a 3-seed, the Bayou Bengals could be ripe for an upset in this tournament. They ranked only 18th in Pomeroy’s ratings — roughly the quality of a No. 5 seed — thanks in large part to a defense that didn’t even crack the nation’s top 60 in adjusted efficiency. (This showed up in the 51 second-half points they allowed to Florida while losing their first game of the SEC tournament.) Their NCAA path isn’t very easy, either: Yale is no pushover as a No. 14 seed, nor is potential second-round opponent Maryland, and we give the Tigers a mere 26 percent chance of beating Michigan State if the teams meet in the Sweet Sixteen. This is easily the lowest-rated top-three seed in the field. Cinderella watch: No. 11 Belmont. The East is top-heavy, with Duke and Michigan State soaking up most of the Final Four odds. But the Bruins are an intriguing lower-seeded team because of an impressive offense led by do-everything swingman Dylan Windler. According to Pomeroy, Belmont ranks 20th in the country in adjusted offensive efficiency (and second nationally in raw points per game behind Gonzaga), while Windler was one of only three players nationally to average 20 points and 10 rebounds per game. Although the Bruins do have to win a play-in game against Temple just to make the field of 64 — we give them a 59 percent chance — they would have a very competitive 39 percent probability of upsetting Maryland in the first round and an even better chance against the LSU/Yale winner. Three years ago, zzo said he thought his 6-foot-1 freshman could be Michigan State’s best passer since Magic Johnson. The Spartans’ do-everything point guard — one of the best facilitators in the country — is validating his coach’s comment. Only Murray State’s Ja Morant, a surefire lottery pick in this year’s draft, has a higher assist rate than Winston (46.0 percent). And behind Winston, the Spartans assist on the highest rate of field goals in the country. Top seed outlook: Gonzaga is the best team in the West by a considerable margin, but the Zags, despite reaching the final two years ago, haven’t always performed well under the bright lights of the tournament. Still, Gonzaga has a 70 percent probability of reaching the Elite Eight, according to our model, and the third-best odds of any team to reach the national championship game (26 percent). Should Gonzaga face Syracuse in the second round, the zone defense of the Orange could give the Bulldogs trouble. This is the best offense Mark Few has had in Spokane, but it may be tested by any of the terrific defenses in the West: Four of the top 15 can be found in this region, including the top two in Texas Tech and Michigan. Sneaky Final Four pick: No. 4 Florida State. A fixture in the KenPom Top 20 for most of the season, the Seminoles are hoping to build on last season’s tournament run, which saw them come within a 4-point margin of making the Final Four. FSU has a dominant defense (No. 9 in Pomeroy’s ratings) and a balanced roster that saw four players accumulate at least 2.5 win shares. This draw isn’t terrible, either: Vermont isn’t especially difficult as a first-round foe, and Marquette is very beatable (more on that below). No. 1 seeded Gonzaga probably looms after that, and we give FSU a 24 percent chance against the Zags — but the Seminoles would have a 48 percent chance of making the Final Four if they were to pull off the upset. Don’t bet on: No. 5 Marquette. 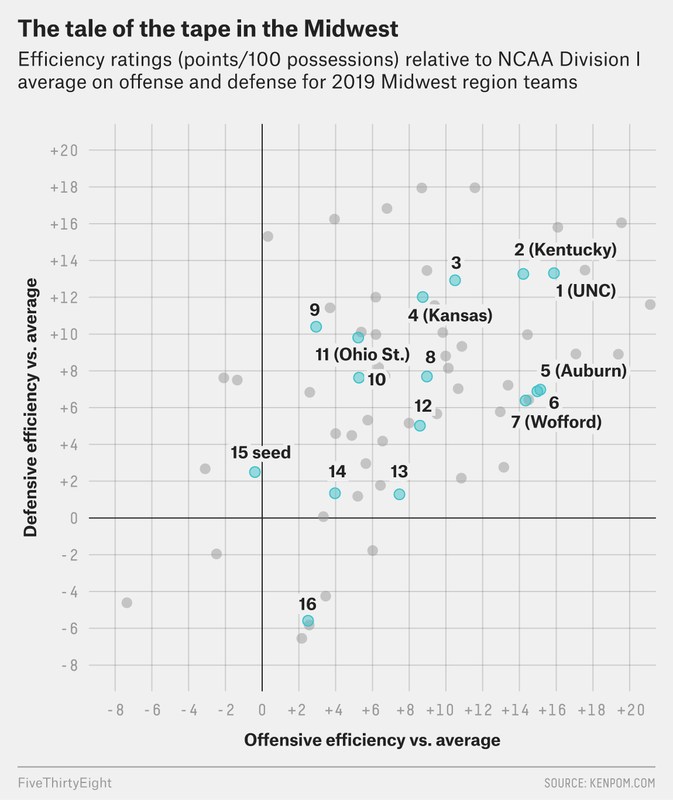 Teams seeded fifth aren’t usually good bets to make it past the Sweet 16 anyway, but Marquette might be an especially bad pick. According to the FiveThirtyEight power ratings, the Golden Eagles are by far the worst No. 5 seed in the field, and a first-round date with breakout mid-major superstar Ja Morant didn’t do them any favors. Marquette has some star power of its own in junior guard Markus Howard, who ranks sixth in the nation with an average of 25 points per game, but this team lost five of its last six games and has a tough tournament road ahead of it. Cinderella watch: No. 10 Florida. The Gators may have been one of the final bubble teams to sneak into the field of 68, but they could be poised to do some damage now that they are here. They drew Nevada, a so-so No. 7 seed, in the first round, and we give Florida a 42 percent chance of pulling the upset there. Last year’s national runner-up, Michigan, likely waits in Round 2, and that is a tough matchup (23 percent odds for Florida) — but if the Gators win, they have a 38 percent chance of making the Elite Eight. In a region with a number of good-but-flawed options, Florida looks better than the typical 10-seed. The linchpin of the Zags isn’t the consensus lottery pick, nor the two veteran guards who have together started 87 percent of Gonzaga’s games over the past two seasons. It’s Brandon Clarke, a transfer from San Jose State who is in his first active season with the team. He’s perhaps the most underappreciated player in the country. On a team that typically features a 7-footer protecting the rim, it’s Clarke, at 6-foot-8, who is tasked with protecting the paint this season. Clarke has responded by setting a single-season blocks record and posting the highest block rate of any team under Few. Top seed outlook: Can No. 1 Virginia exorcise last year’s demons now that the team is at full strength? Our model thinks so. The Cavaliers have a 49 percent probability of cracking the Final Four and a 31 percent probability of reaching what would be the program’s first national title game. With De’Andre Hunter, who wasn’t on the court last year during UVA’s historic loss to No. 16 Maryland Baltimore County, the Cavaliers have been dominant on both ends — the only team ranking in the top five in Pomeroy’s adjusted offense and defense metrics. Once again, Tony Bennett’s pack line defense is suffocating most every offensive opportunity and successfully turning games into rock fights. But this year’s team is even better on the offensive end and should breeze into the Elite Eight, where it could meet Tennessee. Thanks to Grant Williams and the wonderfully named Admiral Schofield, the No. 2 Volunteers are playing their best basketball in program history. We give them a 22 percent probability of reaching the Final Four. Sneaky Final Four pick: No. 6 Villanova. Is it “sneaky” to pick the team that’s won two of the past three national titles? Maybe not. But this hasn’t been the same team that coach Jay Wright guided to those championships. After losing a ton of its best players from last year’s title-winning team, the Wildcats had an up-and-down year and lost five of their final eight regular-season Big East games. 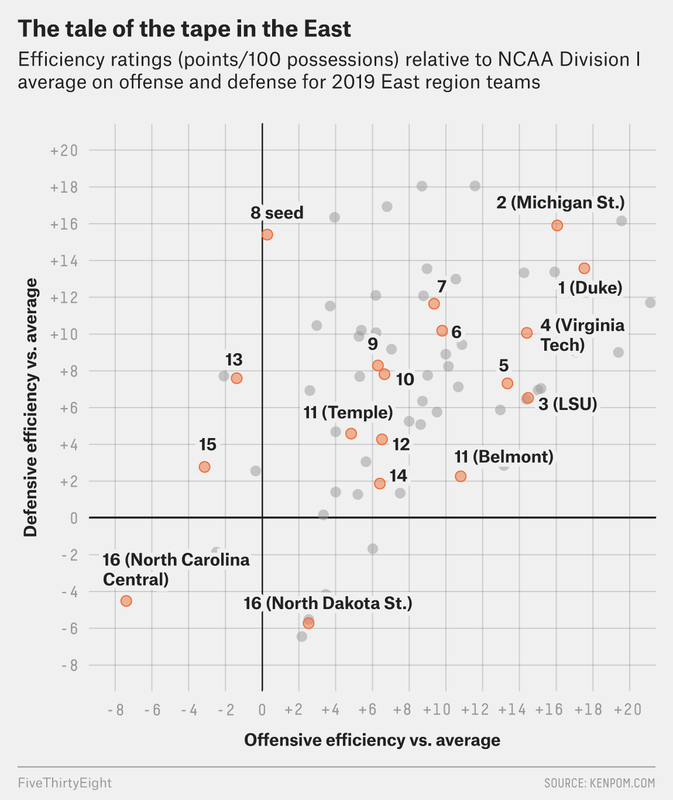 But they also got hot over the past week, capping off a season in which they still won the Big East regular-season and conference-tournament titles — and still had one of the 20 best offenses in the country according to KenPom (powered by an absurd number of 3-pointers). Our power ratings think they’re the fourth-best team in the South despite being the No. 6 seed, and they have a 5 percent chance of making it back to the Final Four for a third time in four seasons. Don’t bet on: No. 4 Kansas State. Coach Bruce Weber’s Wildcats nearly made the Final Four last season, but they might find it tougher this time around. K-State has an elite defense (it ranks fourth in the country according to Pomeroy’s ratings), but its offense is prone to struggles — and could be down its second-leading scorer, forward Dean Wade, who missed the team’s Big 12 tournament loss to Iowa State with a foot injury. A brutal draw that gives the Wildcats tough No. 13 seed UC Irvine in the first round, then places them opposite the Wisconsin-Oregon winner in Round 2, could limit their potential to advance deep into a second consecutive tournament. Cinderella watch: No. 12 Oregon. According to our model, the Ducks have the best Sweet 16 odds (24 percent) of any double-digit seed in the tournament, more than twice that of any other candidate. Oregon struggled to string together wins for most of the regular season, and its chances seemed sunk after 7-foot-2 phenom Bol Bol was lost for the season with a foot injury in January. But the Ducks have rallied to win eight straight games heading into the tournament, including a convincing victory in Saturday’s Pac-12 championship. 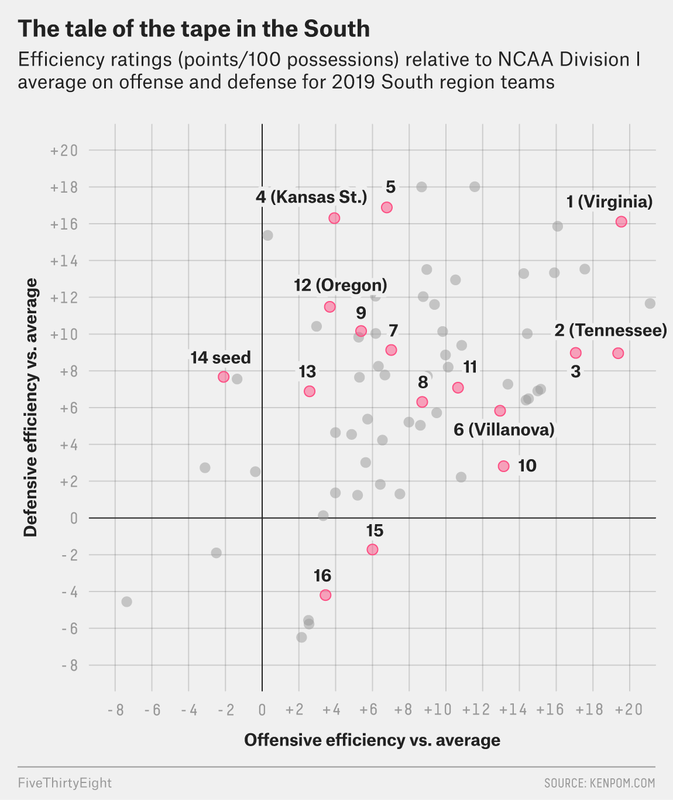 Oregon fits a similar mold as K-State — great defense with a suspect offense — but that’s telling, given that the Ducks are a 12-seed and the Wildcats are a No. 4. If they meet in the Round of 32, we give Oregon a 47 percent chance at the upset. The junior has come a long way from being “just a fat boy with some skill.” Williams, the de facto leader of Rick Barnes’s Volunteers, has bullied the SEC over the past two seasons, collecting two consecutive conference player of the year honors. The Vols might just feature the best offense of Barnes’s coaching career — and we’re talking about a guy who coached Kevin Durant! Much of that offensive potency can be traced to Williams, the team’s leading scorer and rebounder, who ranks in the 97th percentile in scoring efficiency, according to data courtesy of Synergy Sports. Williams possesses an old-man game you might find at a local YMCA, a back-to-the-basket, footwork-proficient offensive assault that manifests primarily in post-ups, where he ranks in the 98th percentile in scoring efficiency and shoots an adjusted field-goal percentage of 56.1. He can get the Volunteers buckets in the waning moments of games, too, as he ranks in the 96th percentile in isolation scoring efficiency. Top seed outlook: On paper, the Midwest seems to be the most open of the four regions, but we still give No. 1 North Carolina the best odds, with a 35 percent probability of reaching the Final Four and an 18 percent probability of appearing in the national championship game. Those odds are at least 8 percentage points lower than any other No. 1 team in the field, though, and for good reason: North Carolina’s offense depends on turning every play into a fast break. The Tar Heels struggle to get to the free-throw line and give up a ton of shots along the perimeter, which, in a slowed-down, half-court matchup, could be quite problematic. After getting waxed by Duke to open the season, No. 2 Kentucky has caught fire in recent weeks while finding balance on both ends of the floor and mostly abstaining from the 3-point line. No. 3 Houston, meanwhile, is in the midst of its best season since Clyde Drexler and Hakeem Olajuwon were revolutionizing college basketball, and they boast a defense that ranks among the very best along and inside the perimeter. Sneaky Final Four pick: No. 5 Auburn. When the Tigers steamrolled Tennessee 84-64 in Sunday’s SEC title game, it likely got the attention of a lot of bracket-pickers. That wasn’t a one-off — Auburn also beat Tennessee eight days earlier, part of a string of eight straight wins for the Tigers, and 10 in their last 11 games. With an explosive offense (No. 8 in KenPom efficiency) that got more of its points from downtown than any other team in the NCAA field, Auburn can heat up in a hurry. We give the Tigers nearly a coin-flip’s odds of making the Sweet 16 — and a very solid 37 percent chance of beating top-seeded North Carolina if the Tar Heels are waiting for Auburn there. The only kryptonite might be a hypothetical regional-final matchup with No. 2 seed Kentucky, which beat the Tigers by 27 in late February to sweep their season series. Don’t bet on: No. 4 Kansas. The Jayhawks went into the season ranked No. 1 in the AP’s preseason poll, and they appeared to validate the choice by starting the season 10-0. But a 15-9 record (and some key injuries) since then have cast doubt on Kansas’s NCAA Tournament potential. This is a well-balanced team, but to say it doesn’t shoot well from the outside is an understatement — see KU’s 3-for-18 performance from deep in Saturday’s Big 12 ouster against Iowa State. Add an unfavorable draw that puts them on a potential second-round collision course with Auburn (see above), and we give the Jayhawks only an 8 percent chance of making out of the Midwest with their championship hopes intact. Cinderella watch: No. 11 Ohio State. If a Big Ten team that has made 11 Final Fours can be a Cinderella, then you’re looking at it in these Buckeyes. 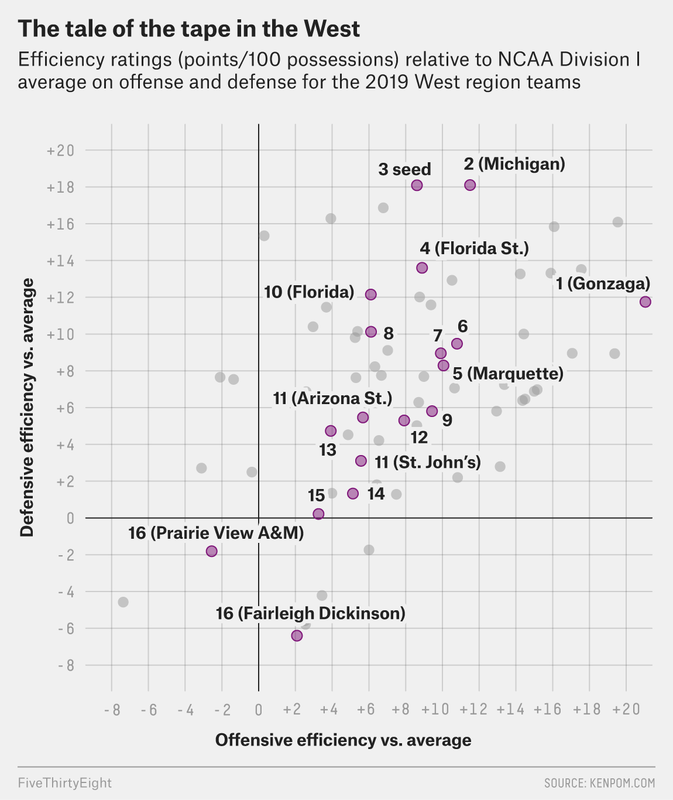 (Hey, the committee’s increasing tendency to seed underwhelming power-conference schools this way really messes with the definition.) OSU went only 18-13 during the regular season, was defeated in its second Big Ten tournament game and has almost twice as many losses as wins since New Year’s. So why are the Buckeyes a potential Cinderella? Despite the seed, this is still a dangerous team, one that ranks 27th in Pomeroy’s adjusted defensive ratings and has star forward Kaleb Wesson back from suspension. So maybe they’ll give Big 12 champ Iowa State trouble. But mainly this tells you something about the other potential Cinderellas in this region: Seton Hall got a very tough first-round matchup with underseeded Wofford; none of the other low seeds here are world-beaters. That leaves the Buckeyes, a team that did all it could to play its way out of the tournament, but has some upset potential regardless. On a team that doesn’t hoist a ton of shots from the perimeter, Johnson is as lethal as they come. Following an injury-riddled campaign in which he barely made more than one-third of his looks from beyond the arc, the grad student is canning 46.5 percent of his attempts, which ranks inside the top 25 nationally. Johnson has thrived in North Carolina’s every-possession-is-a-transition-opportunity scheme this season. He’s blossomed into one of the best scorers in the ACC, ranking between the 85th and 100th percentiles in scoring efficiency in transition, off screens and on spot-ups. Johnson has elevated his game in conference play, boasting the ACC’s top offensive rating (132.5) and true shooting percentage (64.6). Suddenly, a player who wasn’t seen as a guaranteed professional now projects to be a second-round pick. CORRECTION (March 18, 2019, 3:10 p.m.): A previous version of this story misstated the number of Sweet 16s made by Villanova in recent seasons. Although the Wildcats have reached the NCAA Tournament’s “third round” in four of their past five seasons, that round was the Round of 32 until 2016 because of NCAA naming conventions. Granted, they won the title again in 2015 with a team that fell below that benchmark on defense.